June 2011 both the British Guardian News and the Arab Al Jazeera published world maps of "water wars". My own Ecowars Battlefields map have been updated accordingly. Below I take a quick look at the main news and features of the two new maps. Essentially the same type of map I have been building but about water only. Inspired me to add Ecuador, Gaza and the West Bank (in stead of just Israel), Lake Balkhash in Kazakhstan, Cambodia, the Senegal-Mauritania border and Kashmir. Lacks pins at Syria, Iraq, Lebanon and more. Bleeding edge Google technology you have to love. 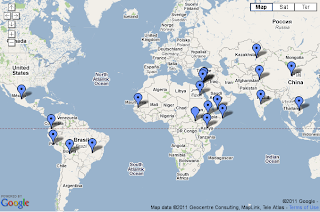 Made me add pins in Namibia, Mauritania, Kuwait, Qatar, Djibouti, Botswana, Azerbaijan and modify about as many. I took the opportunity to update my own map with what the above contributions reminded me of. 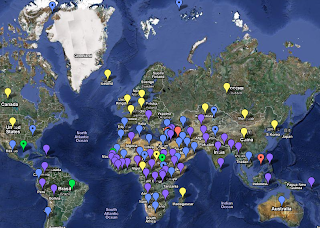 I begun differentiating between pins about countries (no dot) and specific geographical locations (dots); and between water (blue), energy (red) land (green), climate change (and/or related issues, purple) and "mixed bags of trouble" (yellow). Still a work in progress, though. Suggestions appreciated!